The Gracie Jiu-Jitsu history is as complicated as the founding family itself, if not more. 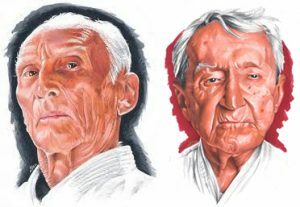 Brothers Helio and Carlos Gracie did a lot to create and promote the art of Brazilian Jiu-Jitsu. However, they also had personal differences which slowly formed two distinctive currents in Jiu-Jitsu. Believe it or not, Brazilian Jiu-Jitsu started off as a family affair. Originally it was a couple of brothers from Brazil that got things going. As everyone who has siblings knows, competitiveness is never far away. Helio and Carlos Gracie were no different. Granted, they were only two and got along great in the beginning. But when you add in offspring that starts to act in the name of their lineage, things get messy. So, as all family affairs, Jiu-Jitsu got messy. To understand what really happened we need to turn to the Gracie Jiu-Jitsu history for some facts and some hear-say. As a matter of fact, both brothers contributed massively to what we know today as Brazilian Jiu-Jitsu. So, before we dig into this complicated Gracie Jiu-Jitsu history, let’s give them the recognition they deserve. Whether you find yourself supporting one school of thought or the other, be sure to show respect for both of them. Because, without one or the other, there would be no Jiu-Jitsu as we know it. When BJJ came to be, the two main culprits behind it were Carlos Gracie Sr. and his brother, Helio. Before it got really complicated it was actually quite simple. Carlos Gracie was the one that founded BJJ. He successfully modified the Judo techniques he learned from Maeda and came up with a style of his own. His brother, Helio learned Jiu-Jitsu from Carlos himself. Back then they worked together towards the development of the art. So far, Gracie BJJ history is simple. After a while, Carlos took up a different role to that of a teacher. His mindset was different from Helio’s which was reflected in his work. Carlos went on to become a business-oriented visionary. He ran everything, from telling Helio what to teach to promoting the art and organizing fights. Carlos at that time was more focused on spreading Gracie Jiu-Jitsu, creating the Gracie diet etc, than teaching. Helio was the embodiment of everything Carlos did, he followed the diet, taught classes and fought. As such, Carlos was prone to change in order to spread the art as far as possible. Helio, on the other hand, was fiercely loyal to the original teachings that they had developed and continued to teach as he originally did under the tutelage of his brother. This is where the first differences appear to have begun, albeit everything was kept friendly competitive. Carlos Gracie was arguably the most important person in Gracie Jiu-Jitsu History. The firstborn son of Gestao Gracie, Carlos was a small but lively kid. His relentless energy resulted in Gestao introducing young Carlos Gracie to Mitsuo Maeda. the rest, as they say, is history. 1. To be so strong that nothing can disturb your peace of mind. 4. Always look at events from a positive point of view, and turn positivity into a reality in life. 5. Think always in the best, work solely for the best and expect always the best. 6. Always be as enthusiastic about the success of others as you are about your own. 7. Forget about past mistakes and concentrate your energies on the victories ahead. 8. Always keep your fellow men joyful and have a pleasant attitude to all that address you. 9. Spend all the time you need in perfecting yourself but leave no time to criticise the others. 10. Become too big to feel unrest, too noble to feel anger, too strong to feel fear and too happy to tumble in adversity. 11. Always have a positive opinion about yourself and tell it to the world, not through words of vanity but through benevolence. 12. Have the strong belief that the world is beside you if you keep true to what is best within you. To sum Gracie Jiu-Jitsu history, Carlos Gracie represents the sports side of Jiu-Jitsu, while Helio represents the self-defense side. The latter is the traditional side of the art. Now, in the beginning, it all worked quite well, despite these differences. It must be noted that the Gracies are a huge family. Both Carlos and Helio had many children, which is where things actually got complicated. It was the offspring of the original brothers that took the views of their respective predecessor to extreme lengths. While Carlos was still alive, the family worked in unison, as he managed to keep everyone together. After his death, the family’s split opinions can into the spotlight. From there, Jiu-Jitsu went in two separate ways – one geared towards sport (today’s BJJ) and the second towards self-defense (GJJ). Helio’s side of the family, represented by his sons, stayed true to the traditional self-defense spirit of the art. 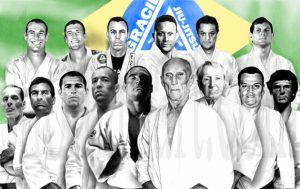 Rorion, Relson, Rickson, Royce, Rolker and Royce Gracie were all representatives of Gracie Jiu-Jitsu (GJJ). To this day, they remain fierce believers in this philosophy and teach their Jiu-Jitsu accordingly. They didn’t compete in sports Jiu-Jitsu and placed heavy emphasis on practical techniques. Even those that did, like Rickson’s son Kron, are famous for disregarding the point system and going for the finish when they did compete. Kron has an astonishing record of almost a hundred wins by submission, most of which while he was behind on points. As mentioned, both brother’s offspring took their fathers’ views out of proportion in the name of loyalty. In one such example, most of Carlos Gracie’s sons, Carlson, Robson, Reylson, Carley etc. claimed to have been trained by their father, rather than by their uncle, Helio. In contrast, one of Carlos’ eldest sons, Reyson claimed that Helio taught everyone. Helio Gracie was known as a hard man to deal with. He was stubborn and strict and was not beyond demonstrating clear favoritism. He always claimed that his sons were invincible, which obviously didn’t go down well with his nephews. This is just one more complicated reason why the family is divided by such a huge rift today. A curious and fascinating story coming out of the family is the one of Rolls Gracie. Rolls is biologically the son of Carlos Gracie. However, he was an illegitimate son that Carlos gave to Helio for adoption. Helio didn’t have any children at the time, so Rolls is technically his eldest son. However, not soon after, Helio go his first biological son, Rorion. Not shy about displaying favoritism Helio gave more attention to his biological son than his adopted nephew. This led to Rolls fighting for his attention, which molded him into the formidable fighter he later became. Carlos and Helio didn’t help the matter by often betting on which of their heirs is better and matching them up. This was a very serious matter for each of the brothers’ descendants, deepening the modern rift. For example, Helio organized a match between Jean Jacques Machado (Carlos’ nephew) and his son Royler, which Machado won. Perhaps the most famous modern-day descendent of Carlos Gracie is his son Carlos Gracie Jr. He is the biggest promoter of the sport and the business side of Jiu-Jitsu. He founded Gracie Barra, the biggest organization in BJJ today. It is a network of academies all over the world, often more than one in a city. They all work in accordance with the same curriculum and the principles that Carlos Gracie Sr. established. They operate as a corporation and are the people behind another huge organization in BJJ – the IBJJF. The IBJJF is the largest competitive organization in Jiu-Jitsu. It is a federation that reigns supreme on the tournament scene. it is also the premier governing body of BJJ, determining a lot of essential aspects of the sport. One such example is the belt system, and in particular, the kids’ belt rankings. Originally, kids had to go through white, yellow, orange and green before adopting the adult rankings. Today there are not only more belts, but also combinations of colors that make little sense. It is the modern business side of BJJ. Another example is the rules of competition. A much-debated subject, IBJJF’s rules are a clear representation of the sports side of BJJ. As in Judo, an IBJJF match has to have a winner. In Judo, the best way to win is by Ippon or a complete point. In BJJ, the Ippon’s counterpart is the submission. If there’s no clear ippon, Judo has a system of half and quarter points. In BJJ there is also a point system, as well as the notorious advantages. Ultimately, even a referee might decide who wins, with all things square. Furthermore, there are lots of “illegal” techniques such as slams or neck cranks. It is a long way from the traditional Jiu-Jitsu. If anyone is really into going deep in Gracie Jiu-Jitsu history, there is a great source to read from. Roger Gracie’s mother, Reila Gracie has a book on the family’s history. It took her an upward of ten years to put “Carlos Gracie: Creator of a Fighting Dynasty” together. There, you will find everything that might interest you regarding the history of Jiu-Jitsu’s most complicated family. Once again, I’m going to highlight the fact that both streams of thought were essential to the creation of modern-day BJJ. You might be more inclined towards one of them because of lineage or personal opinion. However, both Carlos and Helio deserve recognition and respect. Furthermore, all their hard work should result in a unified community instead of a divided one. Rickson’s federation, JJGF represents an attempt to merge Helios traditional approach with modern sports elements. This is a great example of how Gracie Jiu-Jitsu history can be respected while it is modified to fit the modern age.